Using Travel Agencies can be advantageous or disadvantageous depending on the situation and how you like to travel. Travel agencies will often save you valuable travel time and energy as they already have existing connections with guides, and local tour operators. They will have pre-arranged tours and will often handle all necessary logistics. However, they are usually more expensive than planning and doing a trip on your own. If you are on a budget, you should definitely shop around at several different agencies – you will find the prices do vary quite a bit. Sometimes you might even find the different agencies combine their customers into one tour, even though each agency charges a different amount! This was particularly true of some of the agencies in Cuzco. Cuzco, however there are still many travel agencies to choose from, most offering climbing trips of the nearby mountains and volcanoes, rafting, and Colca canyon treks. A 3 day 2 night climb of the famous volcano, El Misti was offered as low as $52 covering the guides some equipment and food. Around $60 to $70/person was the typical price for this climb. Some of the travel agencies are connected to each other by Instant Messaging programs – so we found that if one agency had a particular trip already booked, they could immediately instant message another agency to find out if they still had space. 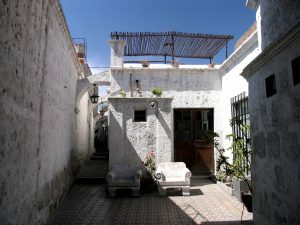 There are many travel agencies in Arequipa. Several of the agencies we visited and or used their services are listed below in alphabetical order. 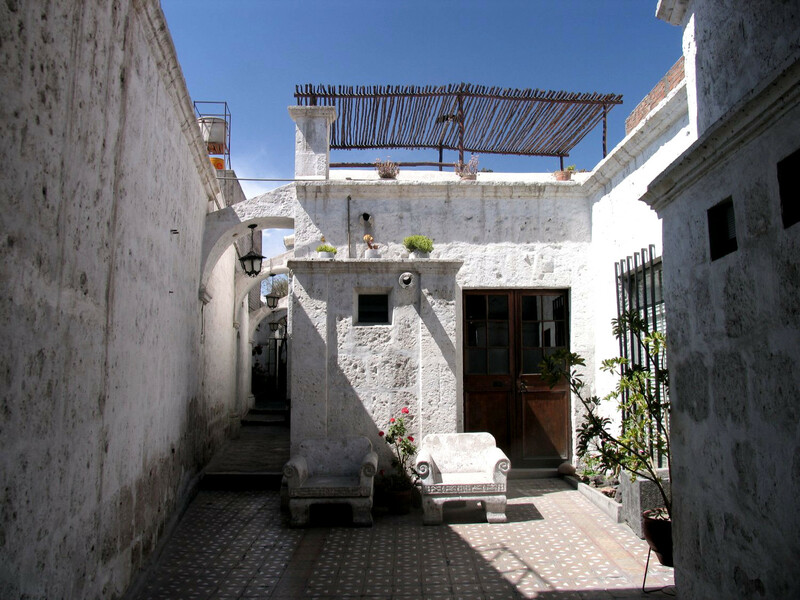 Incaventura is located in Arequipa at Santa Catalina 118-D Cercado. 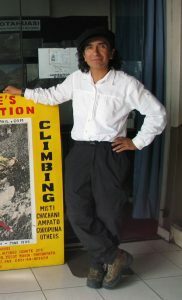 This company offers reasonable priced treks, climbs and rafting trips. They offer several options to hike the Colca Canyon. Be sure to ask for Edison as your guide on the Colca Canyon trip (if he is available). Edison is studying to be a lawyer and guides during his spare time. He’s a great guy. Be sure to talk to either Tessy Mogrovejo Vera or Lizbet Junco Cabrera. They handle the front desk and they both speak English and are fluent in Spanish of course. Zarate Adventures offers a variety of trips including treks, climbing both easy and technical, mountain biking, eco tourism and more. The founder of this company Carlos Zarate is in his late 70’s and he is still putting younger climbers to shame. We met one of his sons, also named Carlos – see photo – and he told us that his father was currently out climbing volcanoes! This company is well-known because its chief guide, Miquel Zarate helped find the famous frozen Inca mummy girl Juanita on Ampato Mountain – a very tall mountain north of Arequipa. They were featured in an article in the National Geographic. Be sure to visit the information about Juanita who is housed in the Museum – Santuarios Andinos.